A speedy recovery for Rishiraj Singh, the adopted son of Kerala and its Transport Commissioner! Thank you for being the 'Messiah' on our roads! And 'Congratulations' to Rishiraj Singh, who is chosen as the 'Newsmaker of 2013', according to the polls by Malayala Manorama'! The charismatic Commissioner of Transport is chosen as the "Newsmaker of 2013', according to the polls by Malayala Manorama! But for Malayaalees, Rishiraj Singh is the 'Uncrowned King' and they don't need any polls for the declaration! Because of the hard work and commitment by Rishiraj Singh in a very short span, even the people on the streets now know that there is a department looking after their road and all those on it! It just shows that doing one's duty is appreciated by the public, even if it meant wearing helmets or seat belts, paying the road tax and licence, use of the 'Speed governors', or just plain 'Obeying the rules' -- a lesson to the rest of the Government employees! Rishiraj Singh is loved and adored by the law abiding citizens, as he has been working miracles on the roads of Kerala and saving lives in a�very short span of becoming the Commissioner of Transport! 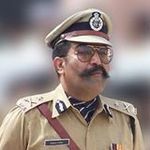 We all are behind you and you will be back on your feet very soon!�Rishiraj Singh IPS had an Angioplasty, following the diagnosis of a block in the coronary artery. He had completed 21 kilometres in two hours and fifty-two minutes in the Kochi Marathon on Sunday and went on to a 'Face to�face'/Traffic Adalath' with the public, as part of his improving the awareness of road traffic rules, during which he developed chest pain and was taken to the hospital. I join everyone in Kerala who are praying for his recovery! I feel that it should be made mandatory that everyone above certain age must have regular medical check up, which will show the need for further tests. I don't know if Rishiraj Singh had an ECG and a Stress test recently, but�if he did, it would probably have shown signs indicating further tests! Rishiraj Singh is a fitness enthusiast and quite fit and therefore, managed to run the full Marathon -- the collateral blood vessels on the heart would have�held up during the Marathon! Perhaps he may have felt discomfort during the Marathon, but he had the pain soon after, when the heart wasn't getting enough blood supply, as the collaterals couldn't cope any more! I have one message for all those around the world who are against the use of helmets while riding bikes, bicycle or skiing or the seat belts while driving a car, bus,etc: if it wasn't for the helmet Michael Schumacher, the greatest driver the sport has ever seen, wore while skiing, he wouldn't have been alive today! Of course, helmets do not prevent accidents, it minimises the injury to the brain. Thanks to the helmet, we still have Michael with us and the doctors can work their magic, with help from above! It's so strange that Michael and Rishiraj Singh were taken to the hospitals around the same time in the afternoon of Sunday, 29 December in different parts of the world -- Michael had the skiing accident at 1100 hrs in the Alps (1530 hrs IST), and Rishiraj Singh had the chest pain at 1430 hrs (IST) and both would have been taken to the hospital around the same time following the incident ! The traditional wisdom may tell us that there may be overriding Universal influences or energy significant periods when there is a concentration of negative energies, but I think it is beyond human comprehension to predict exactly, if one looks at it objectively, as a Realist would! 'Pranayam' ('Breathing exercises', for the uninitiated few to Yoga! ), twice a day for at least 30 minutes would help in preventing and improving the heart block, any many other illnesses like asthma, diabetes, high blood pressure,�migraine,etc. Let's pray for Rishiraj Singh, the 'Saviour of our Roads' to get better soon!